The "Last Lecture" Pausch delivered his "Last Lecture," titled "Really Achieving Your Childhood Dreams," at CMU on September 18, 2007. This talk was modeled after an ongoing series of lectures where top academics are asked to think deeply about what matters to them, and then give a hypothetical "final talk," i.e., "what wisdom would you try to impart to the world if you knew it was your last chance?" Before speaking, Pausch received a long standing ovation from a large crowd of over 400 colleagues and students. When he motioned them to sit down, saying, "Make me earn it," some in the audience shouted back, "You did!" During the lecture, Pausch was upbeat and humorous, alternating between wisecracks, insights on computer science and engineering education, advice on building multi-disciplinary collaborations, working in groups and interacting with other people, offering inspirational life lessons, and performing push-ups on stage. Late in the summer of 2006, I started having some unusual symptoms, culminating with jaudice. Scans revealed it was pancreatic cancer. At this time, my wife Jai and I had a 4 year old, a 2 year old, and a three month old baby. Pancreatic cancer is the most deadly of cancers, with only a 4% 5-year survival rate. The only hope is to be one of the 20% of patients (which I was) where surgery is possible. I had a Whipple surgery on Sept 19th, 2006; Dr. Herbert Zeh removed the (4.5cm) tumor, my gallbladder, 1/3rd of my pancreas, 1/3rd of my stomach, and several feet of my small intestine. I was in the hospital 11 days. Even with a successful Whipple surgery, only 15% of pancreatic cancer patients make it to 5 years, and there is no concensus about which chemotherapy and/or radiation after surgery helps. I found the Virginia Mason protocol, where early trials were claiming to get 45% of people to 5 years. However, it was an extremely toxic combination of chemotherapy and daily radiation: a nation-wide trial was shut down because several patients died from the treatment. There were two centers still offering the treatment: Virginia Mason in Seattle, and MD Anderson in Houston, and I was able to quality for the treatment in Houston. This happened in a whirlwind: the treatment needed to start within 6-8 weeks of the surgery. And Jai & I needed to figure out how to have somebody stay with me full time, and also take care of our 3 kids. I spent November and December at MD Anderson receiving IV Cisplatin once a week, interferon injections three times a week, continuous infusion 5-FU, and daily radiation. Fortunately, Jai's brother and sister-in-law took in our three kids (on top of their 8 and 12 year old), in Norfolk Virginia, while Jai stayed with me in Houston. Every weekend, Jai flew to Norfolk to be with our kids, and my sister Ruby or one of my friends (thank God for Jessica Hodgins, Scott Sherman, and Jack Sheriff) would come stay with me. I was also blessed with my colleague Chris Hoffmann, a CS professor at Purdue who had been through this exact ordeal two years prior: his encouragment and practical tips were invaluable in getting through the treatment. The less I say about Houston the better, but by the end I was barely able to walk, and my weight (starting at 182) dropped to 138. The next four months of chemo (continuous infusion 5-FU) was back in Pittsburgh, through May 2007. Now, I'm 168 pounds and look normal. (To answer everybody's first question, no, my hair never fell out). One additional treatment is a vaccine done at Johns Hopkins: I don't expect it will change my odds much, but it can't hurt. I still have digestive inconveniences from the Whipple surgery: I have to eat 5 small meals a day and take pills with each meal, and I have some abdominal cramping from time to time. A small price to pay for walking around. In August of 2007, we learned that the cancer had returned, having metastasized to my liver and spleen, which is a death sentence. At that time, the doctors gave me an estimate of having 3-6 months of healthy living left. On Oct 1st, we learned that the first round of palliative chemotherapy was working, and that I would likely be "more like the 6 than like the 3 in that estimate." As of December, 2007, the palliative chemo (gemcitabine+tarceva) is working, and the doctors' best estimate is that it will continue to work for another 2-4 months (that's a guess; it's obviously a bell shaped curve); then the tumors will once again start to grow. There aren't many good "plan Bs" out there after that. My wife Jai has been an incredible source of stability and courage through all this. We both agree that "you can't control the cards you're dealt, just how you play the hand." 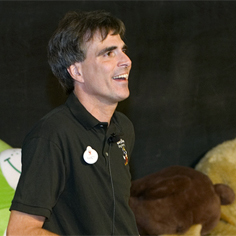 July 25 2008 PITTSBURGH - Randy Pausch, a Carnegie Mellon University computer scientist whose "last lecture" about facing terminal cancer became an Internet sensation and a best-selling book, died Friday. He was 47. Pausch celebrated living the life he had always dreamed of instead of concentrating on impending death. "The lecture was for my kids, but if others are finding value in it, that is wonderful," Pausch wrote on his Web site. "But rest assured; I'm hardly unique.